In America’s Gulf Coast region, where grounded oil tankers are being broken down for parts, Nailer, a teenage boy, works the light crew, scavenging for copper wiring just to make quota– and hopefully live to see another day. But when, by luck or chance, he discovers an exquisite clipper ship beached during a recent hurricane, Nailer faces the most important decision of his life: Strip the ship for all it’s worth or rescue its lone survivor, a beautiful and wealthy girl who could lead him to a better life…. I was afraid to pick up this book because it’s written for young adults. However, in my current, personal quest to stop being so judgmental against YA titles, I decided to pick it up. That, and the whole premise Ship Breaker is built on fascinated me. Plus, Bacigalupi seems to be the “hot name” in speculative fiction right now, I felt like I had to read something from him. I lived on the Mississippi Gulf Coast for roughly 8 months doing hurricane Katrina relief. When I read what this book was about, and that it’s location was probably right about where I was living, I had to explore it. The picture Bacigalupi paints about the poor making paltry livings off of scavenging the copper wiring and other useable parts from broken down freighters brought back some very real memories of my time on the battered and beaten Gulf Coast. It chilled me because, on some level, I’ve seen it, lived it, and scavenged through wreckage just like that myself. This book follows the life of a teenager named Nailer, who spends his time scurrying around those broken down freighters and pulling parts to meet quota. The world is bleak, the living conditions are horrible and Nailer’s father is, quite honestly, terrifying. There is almost nothing about this book, besides the slightly simple writing style, that screams young adult, making it an easy YA/adult crossover. The world Bacigalupi paints is cutthroat, dog-eat-dog and bitterly true to his futuristic vision. Bacigalupi’s writing style is deceptively simplistic for such a thought provoking work. 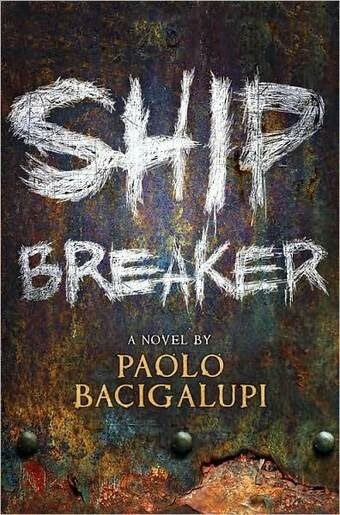 Ship Breaker is an amazingly fast read, the plot drives relentlessly forward and its dark pitch is compelling in an almost macabre way. His world is incredibly interesting. A mesh of global warming, poverty, lack of education, a class system (of sorts) and no oil mix together creating a dreary picture you can’t help but keep reading about. I will be honest, I did feel more interested in the future world situation presented to me in this book than the characters or overall plot though I’m not sure if that’s because of the slightly simpler than I’m used to writing or (my personal hunch) if it is because I just can’t really get into young adult books for some ridiculous reason. Nailer was the most developed character, though it took me a while to get incredibly interested in his point of view. At the start of Ship Breaker I felt the world was far more interesting than the characters. There was a pivot point about half way into things where that was flipped on its head and the characters became far more interesting than the world, which grew to be almost washed out toward the end of the book. Furthermore, the secondary characters do tend to suffer from some two-dimensional issues at times, which can rank them with interesting background noise in portions of this work. Despite a somewhat predictable plot and it’s young adult marketing Ship Breaker never strays from it’s incredibly dark core and is certain to make even the staunchest adult sit back and ponder a few things. Perhaps because his oil-less, global warming ravaged world could be entirely possible. It was quite incredible, and very chilling for me to read a book about “what could be” (albeit, on a dramatic scale). Not all of Ship Breaker is dark. There is hope interspersed throughout this book, a very necessary silver lining that helps drag the plot from the depths and push it forward, brightening with each page. In a world where the gods are based on the Scavenge and Rust Angels and where luck is currency and poverty is plentiful, it’s not all bad. If the ending was predictable, it was endearing to the overall tale and I am certain there is potential for many to find this book heart warming. In that respect Bacigalupi perfectly balances the darkness with promising portions of light and growth which keeps you from needing to pop some Prozac when reading. The intricate, somewhat subtle balance of these two polar elements is what really makes this book shine. Ship Breaker is bleak and almost impossibly young adult. Nailer is an easy character to step into. The writing is deceptively simple; the plot is dark but filled with subtle silver linings. If the world and characters do, at times, suffer, the breakneck pace of events unfolding will keep you hanging on for more. This book was an amazingly quick read for me. I simply could not put it down until I finished it. Readers willing to brave this dark world will find a captivating, thought provoking read. Man, how fast do you read? A book a day? I wish I read that fast, but it's taking me forever to finish books lately. I need to try something by this author. I am a really, really fast reader but I've had a few reviews postponed for various reasons which is why it seems like I've been reading a book a day this week. I haven't been. Not even close…. I also wish I read as quickly as you! This is a book I almost picked up once; I kind of wish I had now. I do want to read something by Paulo Bacigalupi, but I'm torn about whether to start here or with The Windup Girl. This sounds like an intense novel. I'm glad that there are these books that breach the gap between YA and adult fiction, I feel that too often they are two different entities. I'm not usually a YA reader, but this certainly is tempting. I'm not usually a YA reader, either. I have problems getting into the books for some reason but this one wasn't as bad as others that I've tried. Intense is a good word for it. Bacigalupi is on my 'to read list'. grreat review – loved your personal connection to the setting. Bacigalupi is one of my favorite new authors. I've loved everything written by him so far and Ship Breaker is no exception. Mark, thanks for the compliment! Benjamin – He's definitely an author to pay attention to. Ship Breaker made me excited to read The Windup Girl. I really can't wait to read Bacigalupi's stuff. I am reading The Windup Girl next week, and if I liked it I'll definitely pick this one up. After talking about it with other bloggers, I think YA is sometimes overused and is a misnomer for some books. Maybe not with this one, but I am definitely opening myself up to it more in the future. Nice review. Looks like a good book!